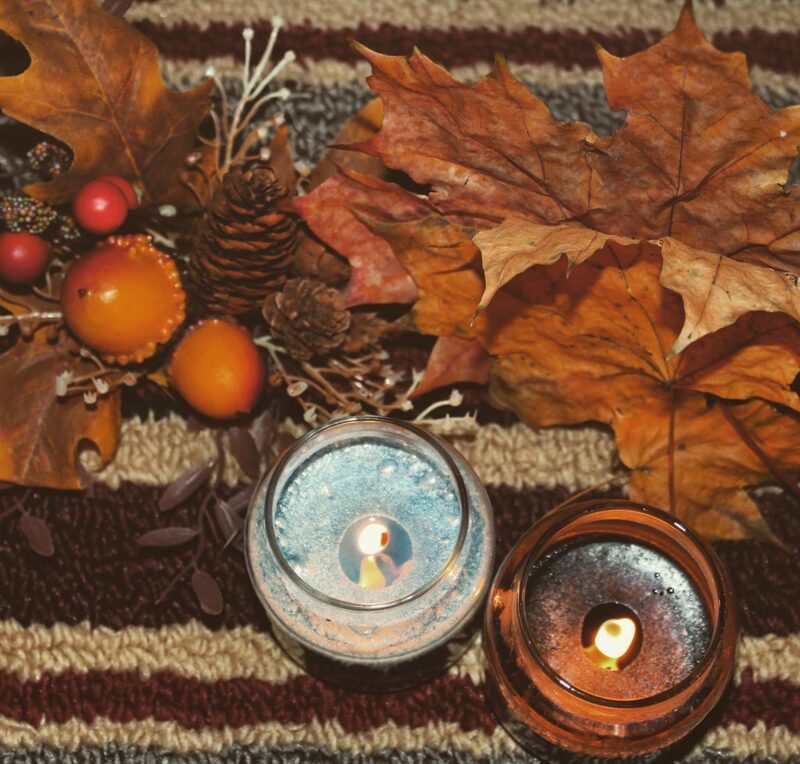 The season of Autumn is in full swing and as the days get colder and shorter, to help me get into the spirit of the season, I have started to light scented candles around the house, which gives it a nice Autumnal feel. Back home in India, the Diwali celebrations just took place and as I am far away and not able to take part in the festivities this small gesture also helped me get into the Diwali spirit. 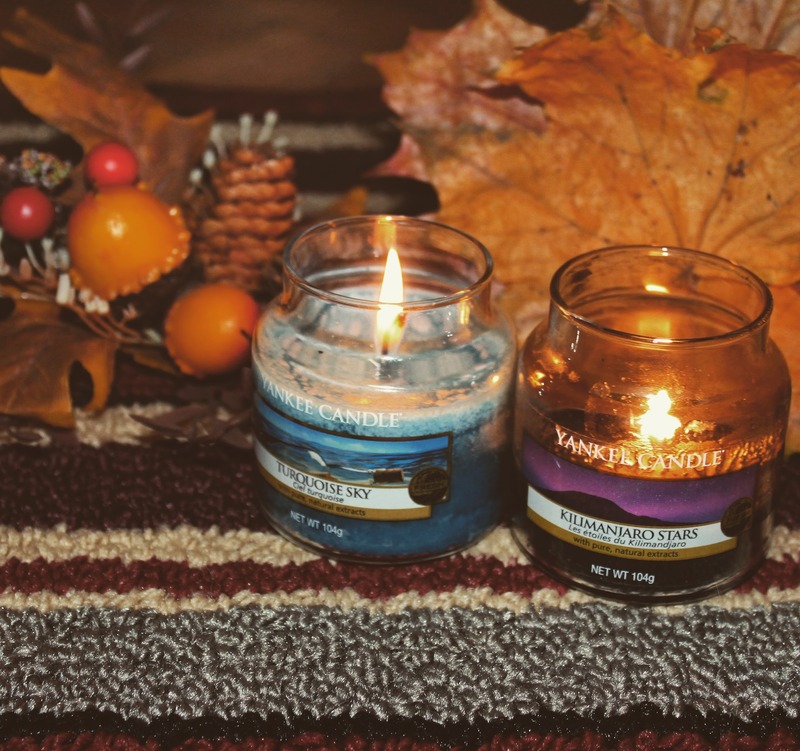 I have a small selection of scented candles and recently picked up another one from Yankee Candles called Turquoise Sky. It was a hard choice, to decide which ones I liked the most after standing in the store, sniffing around twenty scents from the brand. I finally settled on Turquoise Sky and was almost tempted to get Autumn Night as well. I have heard a lot about this brand and I must say they have quite a selection to choose from. I have had Kilimanjaro Stars for almost a year now and I am very happy with it. There is something soothing about the warm scents filling my home and is a good stress reliever too. In a few days from now, we will have All Saint’s Day and All Soul’s Day celebrations here in Poland. The mood is generally more sombre and it is customary for Polish people to visit the gravesides of their deceased family members to place fresh flowers and light a few candles or as it’s called Znicze(Zni-che). The 1st of November is a national holiday on the account of Soul’s Day. I wrote a separate piece about this holiday for The Krakowist. Since we are on the topic of Soul’s Day and lighting of candles, I thought I would share with you some tips and tricks of candle care, to make the most use out of your candles and also to share this cute info-graphic which I found on the web (I have slightly modified it to fit into a photo (JPEG image)). If you are using soy-based scented candles, then it’s good for you, as it releases health-reinforcing soy into the air, which gives the body a sense of overall calm. Candlelight sets the mood and makes everything better looking. Candlelight is gentle and your mind can focus better. Candles, it appears brings out your personality. With a wide array of scents to choose from – fruity, woody, earthy, sweet and everything in between, lighting scented candles makes your space your own and empowers you. Those suffering from sleeping problems may find it beneficial to use scented candles to help them calm and to relax before you go to sleep. I also do some quiet meditation using the Calm app on my phone. Scented candles can affect your mood based on the scent. As the sense of smell is connected to the memory, it’s also connected to our pathological receptors as well. Other benefits include- eliminate feelings of depression, relieves different types of body pain, increases energy levels and circulation, boosts immune system etc. Aromatherapy is a known stress reliever and is often used a lot of Spa treatments. 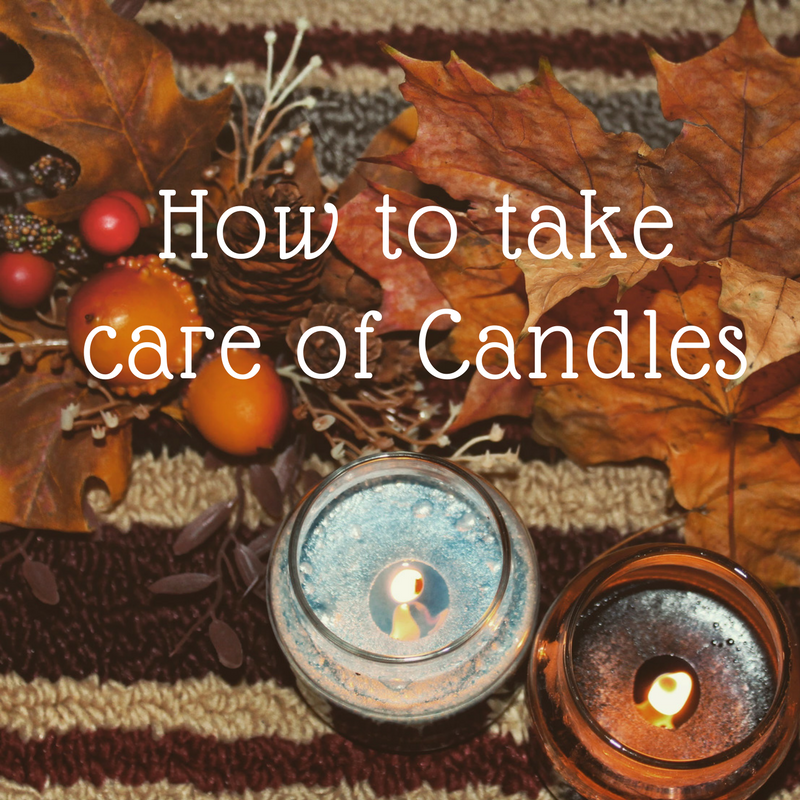 Candles burn more beautifully when they are taken care of, in a manner depending on the model and form. Candles should not be placed too near to each other (maintain a 15-cm space). Avoid a draught of any type. When burning a new candle, set its wick at an angle, so that it can adapt its natural inclination as quickly as possible. The ideal wick length during burning is 15 mm. A wick that is too long tends to create smoke. If this occurs, the wick should be trimmed using special scissors for wick cutting. If the wick is too short, the flame becomes smaller. Carefully drain the basin of the candle. The edge of the candle, which was formed during burning, should be trimmed off after the candle is extinguished, while it is still warm. Keep the candle stands clean (e.g. remove burnt matches and other waste). If the candle is burning on one side, carefully position the wick in the other direction. The best way to extinguish candles is to dip the wick in liquid wax and then immediately straighten the wick. This will prevent the wick from glowing. Thick candles should be burned long enough for the basin to be filled entirely. After being extinguished, the knot cannot be damaged or broken off. 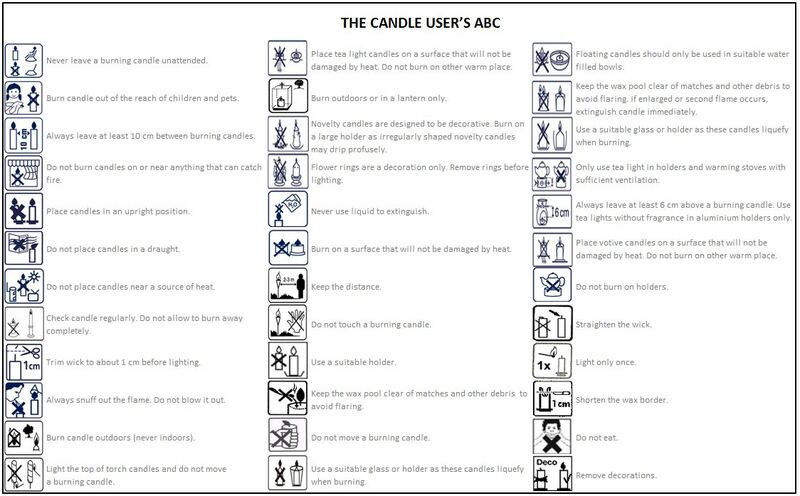 Candles should never be burned without a non-flammable stand. Here is a small infographic which I found useful as we often time see these symbols on the candle jars, but never realised what they actually mean. As usual, thank you for stopping by and reading this and other posts on my blog. Do let me know your thoughts on this post if you found it useful. Liked this post, then you can Pinit for future reference.